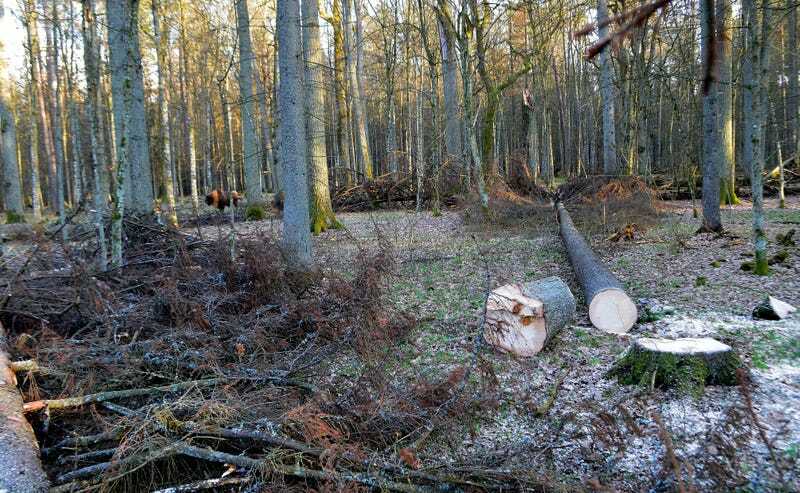 The European Court of Justice (ECJ) issued a statement on Tuesday declaring that Poland had broken international law by increasing logging in one of Europe’s largest primeval woodlands. The Białowieża forest is an 830-square mile patch of green that straddles the border between Poland and Belarus. It’s one of the last old-growth forests in Europe, is a UNESCO World Heritage, is protected under the EU’s Natura 2000 program, and is home to a number of endemic and endangered species, including the largest roaming population of European bison. But all that didn’t stop Poland from increasing industrial logging in the forest; in 2016 the Polish government authorized a three-fold increase in logging operations in the Białowieża Forest. In response, the ECJ sued Poland, attempting to block the increase in logging. On Tuesday, an advocate general of the ECJ, Yves Bot, issued a legal opinion, concluding that Poland had violated EU laws. Not surprisingly, Bot found that the ripping up of the ancient forest poses “potential threats to the conservation of protected habitats and species.” The opinion isn’t legally binding, but the ECJ normally follows through with the recommendations of the advocate general. Moreover, Poland has vowed publicly that it will respect the ruling from the court.